Here's a closer look at some of the inconsistencies found in Toronto Mayor Rob Ford's remarks during his interview with CBC News reporter Dwight Drummond. In his first post-rehab interview, Toronto Mayor Rob Ford admits to "lying, conniving and hiding to cover up" his substance-abuse problems. The mayor’s deceptions have led his political opponents and members of the public to question his most recent public statements, not least a remark to CBC News reporter Dwight Drummond that his "public record is better than any mayor’s in the city of Toronto." Here’s a closer look at other comments the mayor made in his conversation with Drummond, and inconsistencies in his remarks. "This was all on personal time. I was definitely on the influence of alcohol a number of times here. But there was no drug use here [in the office]," he said. According to police documents in an affidavit, former junior staffer Kia Mejatian gave a statement saying he saw empty alcohol bottles in Ford’s office, but that he also came upon a marijuana cigarette in the mayor’s desk. The joint disappeared days later, Mejatian told police. "I think that goes along with having this disease. It's a chronic, medical condition I never understood. And you do things, you say things that just aren't you," Ford said. The psychological community is split on this defence, said Dr. Jane Storrie, a neuropsychologist and president of the Ontario Psychological Association. Actor Mel Gibson also blamed alcoholism for his anti-Semitic tirade in 2006. Some clinical psychologists say that explanation doesn’t hold water, and that alcohol lowers the inhibitions, which can lead to the user opening up and expressing true feelings that would normally be suppressed. "Some researchers and clinicians think taking substances loosens the lips, and so you end up saying how you’re really feeling," Storrie said. "But others believe substances can make you say things you don’t mean. A larger issue is whether being under the influence absolves someone of responsibility for their words and actions." Joe Killoran, the jogger who confronted Ford during a Canada Day parade in East York, wasn't buying Ford's argument attributing his controversial remarks to alcoholism, and said the mayor needs to take ownership for behaviour "that exists apart from" addiction. "I don't think he was drunk in council when he said Asians 'work like dogs'…or that only gays or drug users get AIDS. I don't think he was drunk every time he refused to go to the Pride parade repeatedly year after year," Killoran said. "I don't think he was drunk when he made the disgusting comment about having 'more than enough to eat at home.'" "You name it, I pretty well covered it. I was in denial. I had a severe problem," Ford told Drummond. The mayor recanted that statement soon afterward, clarifying in a separate interview that he has not used heroin, but has used hallucinogenic mushrooms. Documents detailing police wiretaps and released in December included a conversation in which an alleged gang member claimed to have photographs of the mayor "doing the hezza," a slang term for heroin. 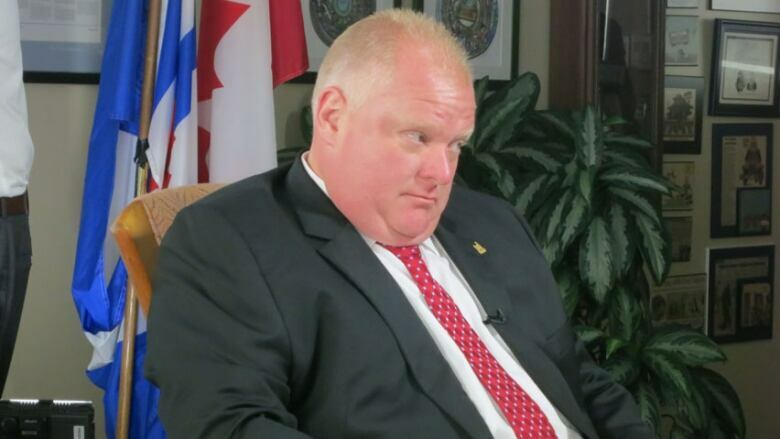 Rob Ford quotes of 2013: What's your favourite? "I think you should speak with Dennis Morris, my lawyer. And if Dennis advises me, I follow his lead.… If your lawyer says, ‘Do not [speak with police],’ you listen to your lawyer, and I have the top criminal lawyer in Canada," Ford said. CBC News has confirmed that police still want to speak with Ford. Legally, he can co-operate if he wants to. His sister, Kathy, has already spoken to investigators twice about smoking crack with him. "It's all confidential up there.… Whatever happens at GreeneStone, as you know it's all confidential. I can't divulge any information," Ford said, when asked about his relationship with the Muskoka-area woman charged with impaired driving while behind the wheel of his SUV. While Ford reasoned he can't breach the GreeneStone addiction treatment facility's confidentiality agreement by discussing the McRobb incident, he has spoken freely to the press from rehab before. Last month, Ford spoke to a reporter at the Toronto Sun newspaper while he was receiving treatment, providing updates on his progress. He also sent a photo of himself in a pool at the facility. On Wednesday, mayor admitted to Drummond that he gave McRobb the keys to his Cadillac Escalade in May and said she was not intoxicated at the time.